Ever since I saw Clarence Harrison and Dave Taylor’s modern T-Rex Warden I knew I wanted one of my own..
…but as you’ve probably figured out by now. I ain’t doing no loyalists! So let’s try to break this down shall we. 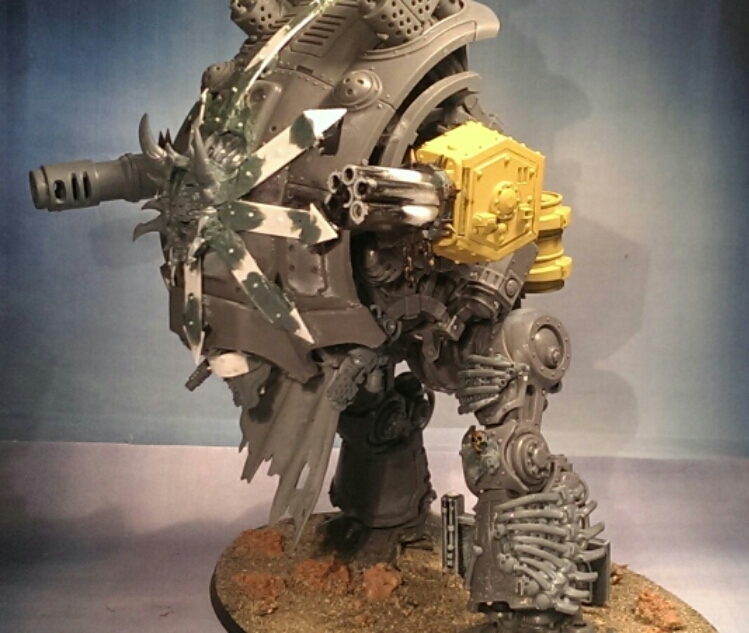 I knew from the start that I wanted to merge the helbrute I had with a knight and use the plasticard star for centering in the rider aka the one-eye. The whole land of the blind is a faith issue and the one-eyed king views the loyalists as blind in their faith in the Corpse-Emperor. Figuratively I also did represent this with the blinded knight head. For me it was always obvious that the Crusader was the obvious ruleset for the T-Rex Warden. So I’m playing this as a Crusader with the battlecannon upgrade. This’ll allow me to field all 4 knights at 1500 points. 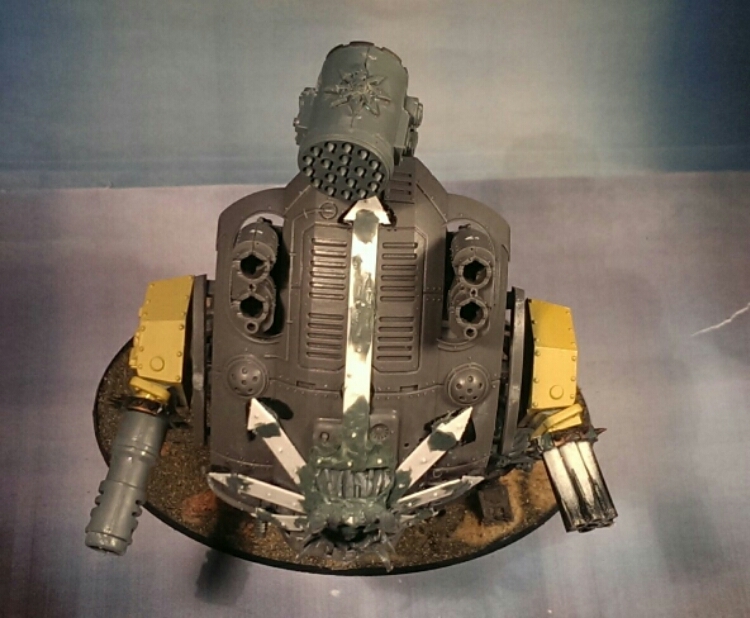 The only thing I don’t have the points for is the carapace mounted rocket launcher. If anything comes close the heavy stubber and flamer deals with them. The compact weapon systems are exceedingly powerful and doesn’t hold back to their modern counterpart. Very nice – like how you’ve tilted the knight chassis over to create something very different to the original. 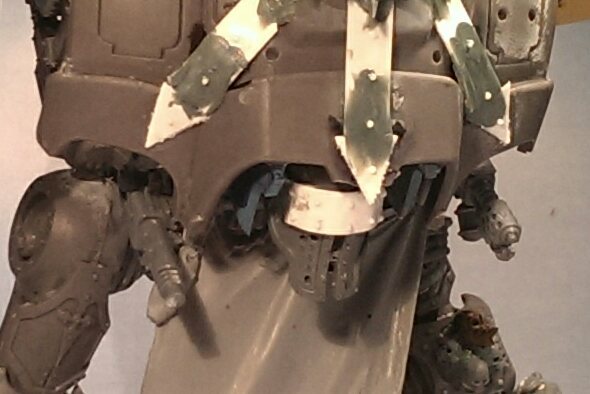 Good use of the helbrute parts as well. And seriously how fast have you worked on these, I’m hurtling towards the one year anniversary of working on my knight and so far I’ve only got a pair of legs! Cheers mate 🙂 I feel that even when it comes to the t-rex pattern that I’ve made something uniquely mine. Yes yes yes yes yes!!!! YES! THIS IS AWESOME! 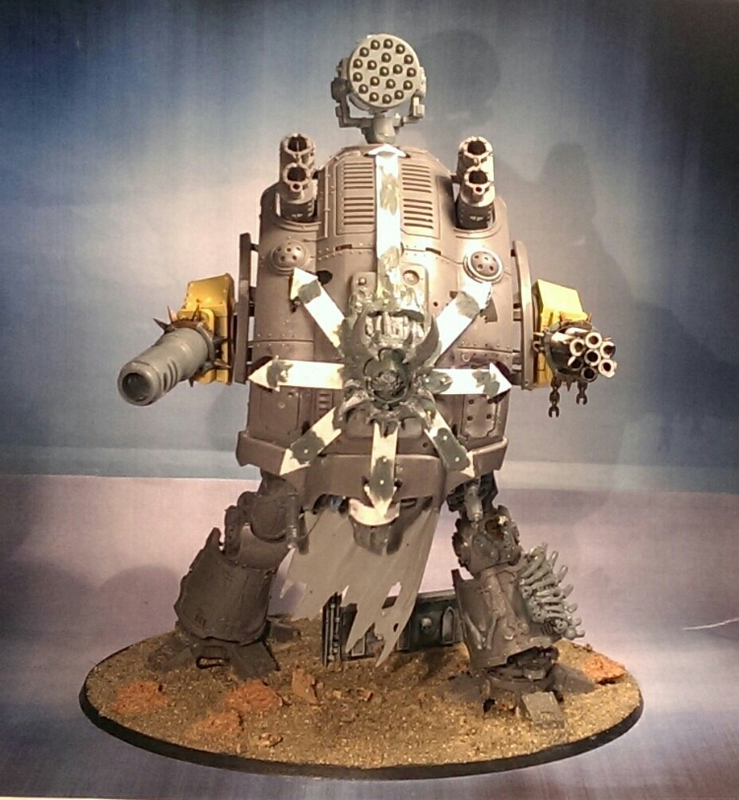 I just looked at it again and I gotta say, this is quite possibly the best chaos knight I’ve seen on the blog sphere. I just can’t even. Yes I can. I can chaos. Thanks Joe 🙂 well practice makes perfect and I must admit that I like the knight kit even better now than prior to starting the project. 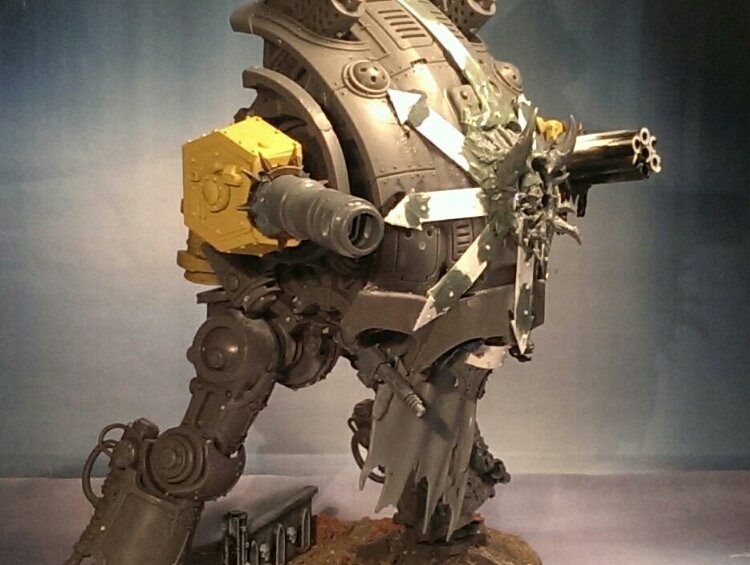 This looks great, the squat warden was always my favourite of the knights, that turkey looking one with the long legs second. 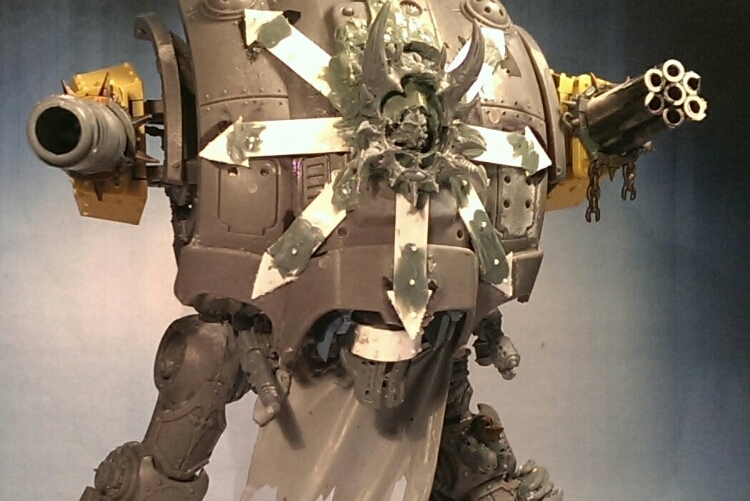 I love the daemon spewing from the middle of the carapace. Nice work all round red. Thanks Ian 🙂 Yeah I totally agree and as I said in the post, when I first saw it I just had to make one of my own. This does look pretty darn cool ^^ paaaaaiiiiint-t-t! I do like the look at that man, very cool.